Do you like garlic? I don’t like eating raw garlic but I love eating baked garlic. It is delicately flavoured and has a savory taste, what is more it doesn’t smell as bad as raw garlic. Some naturopaths seem to think that once the garlic is baked, it is not as beneficial. 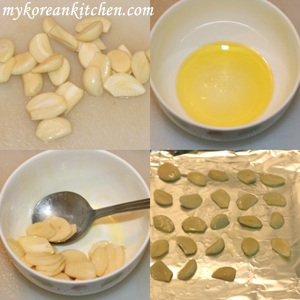 Yet, some Koreans seem to believe that when the garlic is baked what it mostly loses is the bad smell and the good enzymes still remains. What do you think about this? 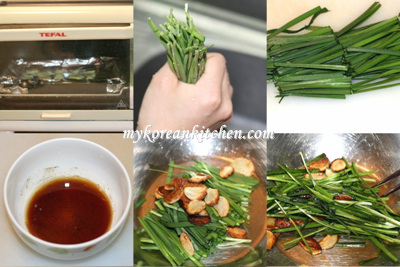 I think this salad goes well with meat, especially with samgyeopsal or as one of the side dishes with rice. It has a slightly sour taste and the flavour and smell from the baked garlic is just so nice. Later, I wished that I had added more garlic. Hope you like it too! Combine the olive oil and salt in a small bowl. Add the garlic and mix them well. Bake the garlic (from step 1) at 180 C until golden brown. Combine the baked garlic and garlic chives in a mixing bowl. 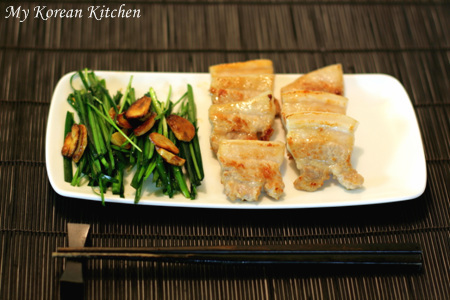 Add the dressing and lightly mix them with chopsticks. Yes, Garlic chives are bu-choo. Thank you for stopping by. 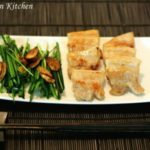 are garlic chives bu-choo? (sorry, can’t type in korean on this computer). thanks! and love the website! Looks like a great way to use a bunch of those garlic chives that take over the garden. Come back to WHB when you can! This looks so yummy, I can almost smell/ taste it. We love baked garlic. I can’t wait to make this dish. If you are considering staying longer in Korea, you might buy a toaster oven. Some cheap ones are available from 25,000 won here. Yes baked garlic is irresistible. Yummy! Thanks for stopping by. I love the grilled BBQ. Recently I am having it once a week at least. Just thinking about baked garlic, my mouth starts to water. 🙂 Thanks for stopping by. I love garlic so much! Even the raw ones. Your picture and presentation is wonderful! Good job again! I like fried garlic bits. Normally what is done is that the garlic is cut into small pieces and then fried in hot oil. 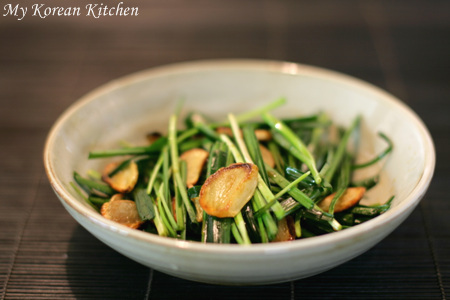 The fried garlic bits can then be used to cook vegetables or sprinkle over steamed fish. The garlic fragance just makes the dishes more appetising. I do agree with you about the garlic. I think baked garlic is divine. This looks very tasty; great photos.